CarShop’s continued dedication to leading the evolution of the automotive retail industry, and delivering exemplary customer experience, has resulted in the award of a number of prestigious accolades across the business. CarShop was ranked number 3 in the United Kingdom. Reviewing the top 50 independent dealers, Motor Trader looked at key performance indicators including turnover, number of outlets and units sold in order to ascertain rankings. This accolade was awarded to CarShop as the judges commended the fast and easy-to-use pages that had been responsively designed, functional features, and an eye-catching layout generating customer satisfaction when searching for vehicles. CarShop received this industry-leading accreditation due to its commitment to growing, developing and investing in its colleagues. In fact, less than 3% of companies awarded Investors in People receive the silver standard. Best Companies Survey in 2016 recognised CarShop for the first time, awarding the retailer a 1 star ‘One to watch’ Best Companies accreditation. This represents ‘very good’ in terms of levels of engagement, giving CarShop a great foundation on which to become a truly great place to work and gain a place on the prestigious ‘Top 100 Best Companies to Work for’ list. This league table is compiled by the leading research & events company Fast Track, who bases their rankings on financial performance, profitability & the growth of each company, among other aspects. For the first time ever, CarShop appeared as one of the top-performing private companies, due to notable growth in all areas of performance. Due to CarShop’s relentless focus in evolving its proposition to ensure that it delivers on every level for the customer, including both its physical and digital spaces, CarShop was able to beat the competition to this highly sought-after award. These efforts factored in aspects such as investment in people, process and technology which, combine together, to ultimately form the bedrock of providing customers with world-class customer care. CarShop picked up this industry-leading award up for the second year running. Pitched against other leading car supermarkets, CarShop took home the award due to its dedication to its colleagues and its customers. Heavy investment into business-evolving processes and customer experience were duly noted as being reasons for this. CarShop’s first award of 2017 was collected by Marketing Director, Leo Nelson. CarShop’s website was recognised as setting the standard for the automotive retail industry, providing the benchmark for which all other retailers should aspire to emulate. Wednesday 12th July saw London’s Grosvenor Hotel play host to one of the biggest evenings in the automotive calendar, the Motor Trader Awards. 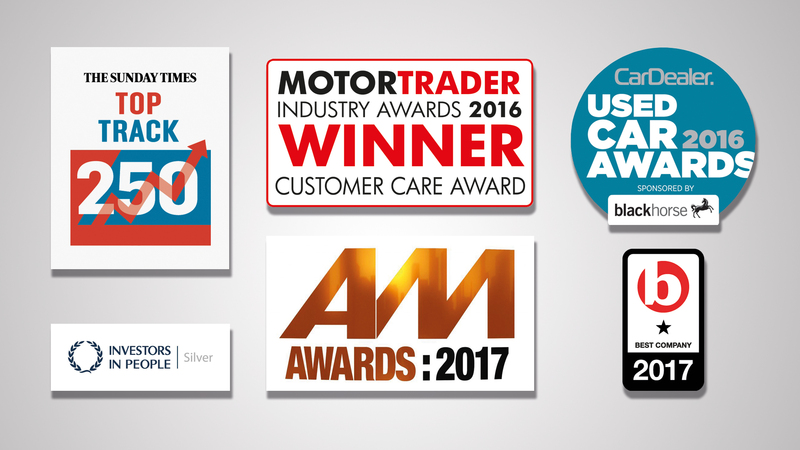 Following on from their Customer Care win at the 2016 awards, CarShop attended the ceremony after being shortlisted in all of the four of the award categories entered. During the night CarShop was announced as the winner of the Used Car Independent Retailer of the Year Award. The prestigious award was collected by Carshop's CEO Jonathan Dunkley. As car retail continues to progress, CarShop is extremely proud to be recognised as a leader in this industry and has ambitious plans to further enhance its digital offering over the next three years. On the 8th February 2018 at Birmingham’s ICC, the annual AM Awards were hosted. CarShop brought home the Social Media Strategy award after beating competitors Marshall’s Motor Group and Bells Crossgar. CarShop was commended on their colleague and customer driven strategy. Going up against over 13,000 car retailers, leading car supermarket, CarShop, won “Retailer of the Year” (200+ cars) at the 11thAuto Trader awards on July 19th 2018. CarShop not only impressed the giants of the judging panel including experts from Compare the Market, Google and uSwitch to name a few, the award also took the opinion of thousands of automotive customers into consideration. Plus, the contenders were also subject to a comprehensive mystery shopper evaluation. Leo Nelson - Marketing and IT Director and Natasha Holland - Partner Marketing Manager, took to the stage to receive the award on behalf of CarShop.